Any filmmaker will vouch for the fact that their creation cannot be completed without prior research. Most often this research would require spending time to understand the subject and the perspectives associated with it. It would mean going deeper into the complexities of the issue and the factors that influence its existence. When it comes to filming and articulating the development crisis in a country like India, it is the vulnerable sections of society and their realities that land up on the other side of the camera. Both research and filmmaking individuals locate themselves into the conventionally understood "expert" domains. In a unique endeavour to break away from this myth, the Community Media Trust (cmt) at the Deccan Development Society (dds) has made many films over the past few years. The 20 Dalit women farmers leading the cmt have chosen their subjects, conceptualized their locations, rolled the camera and pictured realities, which reflect both agricultural crises and the solutions that need recognition. 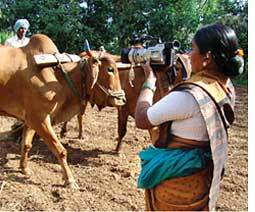 These farmer women have transcended the barriers of being non-literate and used audio and visual equipment as action research tools. Like any filmmaker, they have secured training, financial assistance and help of editors, translators and other technicians. But soon after they have sought to present their world and their issues in a manner that are more than just topics. A set of 12 such films has been put together as part of the multimedia publication under review. The publication showcases the vision of how the most vulnerable communities lead the research, talk to fellow farmers and engage in questions that they have to live with and present it to the world to see. The films deal with four broad topics highlighting the attempts of the Dalit farmers of Karnataka's Medak district on moving towards food sovereignty, a step beyond food security. This segment showcases the successful experiments with the alternative public distribution system, the mass mobilization around millets and other forgotten foods through the mobile biodiversity festivals. Another film in this segment presents the importance of food systems based on coarse grains such as jowar, bajra and other millets. While these have come into the limelight as being nutritious food favoured by the elite, they were once relegated as Dalit or poor man's food and ignored in mainstream agricultural policy. In the second segment, the films deal with efforts to control technology and markets through biofertilizers and millets. It aims at presenting the work of women sanghams in the area to regain their hold over their lives. The next set of films, termed, 'A New Grassroots Globalism in Action', shows international advocacy agendas and inter-country exchanges. The film that brings forth interactions between the women farmers and the Quechua community in Peru and the commonality of the concerns is a well thought out presentation. The final section presents the real challenge of democratizing research. While large seed giants have gone whole hog to promote genetically engineered Bt Cotton to farmers of the country, the cmt is able to delve into a domain of hardships. Two films on how the grassroots confront the technology has testimonies of farmers of Warangal in Andhra Pradesh and some countries in Africa where Bt Cotton has failed. The films and its research take on the propaganda through a deep challenge to governments and corporate sector to look beyond profits. The multimedia publication is a substantive visualization through the audio visual medium. P V Satheesh and Michel Pimbert, with dds and International Institute of Environment and Development (iied), uk, are associated with them in this publication. The two authors who have over the last many years journeyed with the cmt have penned their thoughts that knit together the wide array of films and issues that they attempt to highlight. The message is clear. 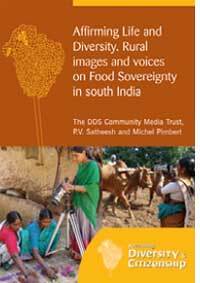 It is important to understand, "the degree to which the marginalized communities and local institutions involved can set research agendas and frame policies for food, farming, environment and human well-being". The challenge is how policy makers, scientists and urban consumers deal with this as it will require a lot of unlearning and humility, from one and many.